Are you planning your Christmas present list yet? 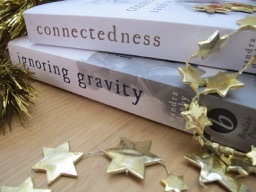 If you know an avid reader who loves the touch and smell of real books, why not give them a signed paperback copy of ‘Ignoring Gravity’ or ‘Connectedness’? Simply click the link below to order at my website. Payment is quick and secure by PayPal and you can specify your personalised dedication. It couldn’t be easier! Available in the UK only. This entry was posted in Books about Spain and tagged Andalucia, books, Christmas books, Christmas gift, Spain on November 18, 2018 by sandradan1.